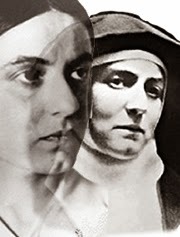 Saint Teresa Benedicta of the Cross, bride of Christ and mother of souls, you went to your martyrdom united with the sacrifice of your Divine Spouse and in solidarity with the suffering of God's Chosen People. to carry out the duties of our state in life with patience, gratitude, and joy. Pray that we may find in our study of your work a compelling vision of our charism of spiritual maternity and how we are to live this charism in a world that denies what it means to be authentically human. May your love of learning rouse us from mental sloth, rebuke our ignorance of the teachings of the Church, and inspire us to use our minds to witness with conviction and courage to the certain victory of Christ the King over every form of evil that plagues us in this world. In Christ's name we pray. Amen.